We are a non-funded, charity-registered club, affiliated to the NSRA and CTSA, and operate under Home Office rules and guidelines. We offer individual one-to-one instruction for first-time shooters, and will provide all necessary equipment during your probationary period to ensure your safety and comfort. The club participates in National and County postal shooting competitions, and also in local County competitions. Any person of the age of twelve years or over is eligible to become a shooting member. 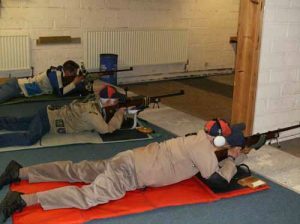 In addition to normal shooting disciplines, we also provide shooting facilities for registered Blind/Visually-Impaired Persons, using specially – adapted conventional air weapons. The premises are heated, and refreshment facilities are available in the club-room.